Will hologram be next bonanza for Samsung? From the hologram rally by Amnesty International held near Cheong Wa Dae in 2016 to the late Michael Jackson’s hologram performance at the 2014 Billboard Music Awards, one may think hologram technology has come to fruition. However, most holograms we can commonly see today are only pseudo-holograms that can only be seen from one side without 3-D effects. For real holograms like those we can see imagined in science-fiction movies, we still have a long way to go, according to experts. Holography is a photographic recording of a light field, rather than of an image formed by a lens, and is used to display a fully three-dimensional image of the subject. Korean tech giants Samsung and LG also started the development of hologram technologies years ago in preparation of future technologies. Samsung Display is currently developing hologram panel technologies for mobile devices under the national project that started in 2015. 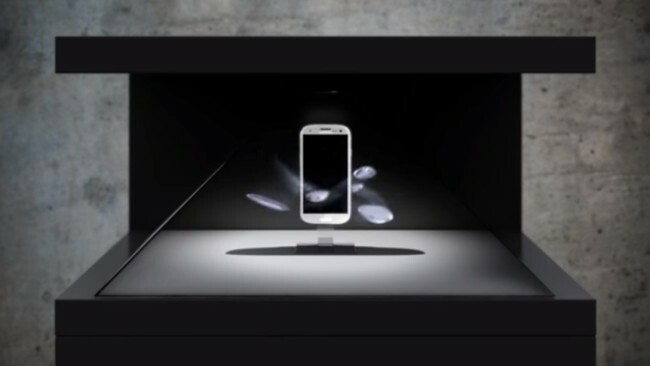 “The hologram technology for mobile devices, once developed, can display 5-inch 3-D holographic images in the air. The pilot video of the super high-definition panels will possibly be made in late 2019 for the first time in the world,” said an official at the state-run Giga Korea Foundation that oversees the nation’s future technologies, including holograms. The holographic images for mobile devices, if developed as planned, will have around four times more pixels than the current Galaxy Note 8’s 570 pixels per inch. More pixels, which mean better and cleaner image quality, is critical to display hologram images in the air. Technical challenges still lie ahead for a commercial launch of mobile devices with hologram technologies due to mass production issues and integrating the panels with communications modules. So Samsung is most likely to launch hologram technologies for head-mounted displays first before unveiling the mobile devices, sources have said. The hologram images displayed through wearables require much less data than images shown in the air without the aid of a head-mounted display. A head-mounted display with hologram technologies is currently being developed by Samsung’s central research arm, Samsung Advanced Institute of Technology. “Samsung’s hologram technology for a head-mounted display has almost completed. But the firm is now weighing whether it is the right time to unveil it in the market for profitable returns,” said a source familiar with the matter. The hologram technology developed by SAIT is similar to German hologram tech firm SeeReal’s “Viewing Window,” where holograms are only viewable in a comparatively small area of a user’s vision. So it is a better fit for head-mounted display. SAIT is currently developing diverse original technologies related to hologram technology, some of which were showcased during its Samsung Tech Fair held on Oct. 30 at Samsung’s corporate campus in Giheung, Gyeonggi Province. A Samsung representative declined to officially comment on hologram technology. Samsung’s local rival LG is also developing hologram technology, although the company appears to have less interest in the futuristic technology than its rival. LG Display has joined a hologram technology project called “digital holographic tabletop display” led by the Electronics and Telecommunications Research Institute, which is also under the government-led Giga Korea project. The tabletop display development started in September 2013 and aims to display a 4.5-inch digital hologram in color that can be seen in the air in a 360 degree space on a table. The hologram technology, when developed, will be used for showing small cultural properties in museums or exhibition. “The development of the original technologies will be completed in early 2018 and the commercial launch will possibly be made around 2021. The technology, when developed, can be used for exhibition and video conference,” said Park Min-sik, a senior researcher at the Electronics and Telecommunications Research Institute. Both Samsung Display and LG Display confirmed they are developing hologram technologies, but declined to further comment, saying the technology is still in the distant future. According to Seoul-based Convergence Research Policy Center, the global hologram market will grow to $74.3 billion in 2025 from $18.2 billion in 2014. The hologram technologies will be used for various areas, including concerts, medical care, security and architecture, according to the center.